I started off today by purchasing some sheet steel from (appropriately named) American Metal Supply Co (http://www.americanmetalsupplyco.com). The rockers panels are made entirely from 18 gauge steel. The cover and outer rocker are plain mild steel but the inner rocker is galvanized. I ended up picking up a left over 2' x 3' piece (they call these pieces a "drop") from a previous cutting job for $15 (this is their minimum charge). I was very impressed with their service and everyone I spoke to was nice to deal with. Their shop was very well organized and kept neat. After I got back from picking up the metal, it was time to work on the car. Today's job was to finish removing the rocker cover and cut out the bad sections of the outer rocker cover. My first attempt at removing the rocker cover was to try and use my spot weld cutter. To use a spot weld cutter, you have to be able to put the cutter face straight against the spot weld. As illustrated in the picture below, the bottom of the rocker cover kicks up and you can't get the cutter into the correct position. 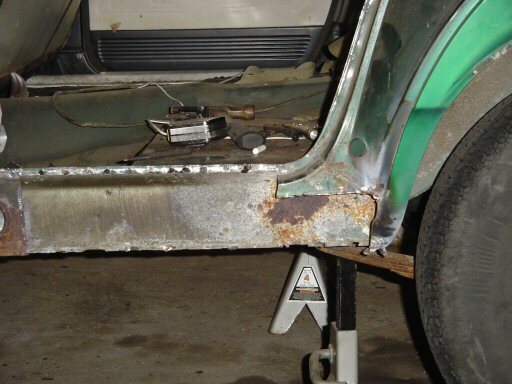 My second attempt was to use my angle grinder to remove the metal around the spot welds. This was not only slow going, but it generated a bunch of very hot sparks and I quit trying after my jeans started smoking. My third attempt was using my die grinder to do the same thing but I don't have any coarse bits for it so I didn't try that for very long since it was slower than the angle grinder. Finally, I ended up using my cut off tool to grind out the areas around the spot weld. This wasn't anywhere near as quick as using the spot weld cutter would have been but it was much faster than the grinder and the shower of sparks was both smaller and went in the opposite direction of the ones from the grinder so they mostly landed on the concrete floor instead of my pants. Before I cut out any spot welds, I cut out as much of the remaining rocker cover as I could so I'd have more room for the cut off tool. After I finished cutting, I spent some time with the grinder and a body hammer and dolly prepping the flanges on the inner rocker for the new metal. I noticed that I got a little carried away with the torch last week and I managed to roll the end of the quarter panel in on itself. I still need to fix that. When I was done, I was left with what you see below. Here's a close up of the front of the door opening. The lower left corner of the outer rocker is pretty rusty and I'll replace it when I install the new section of outer rocker (this still needs to be fabricated). Here's the rear of the door opening. You can clearly see how the end of the quarter panel is rolled in. I was getting too hot and tired to mess with it today but I'll have to fix this before the new rocker cover goes in. You can also see the big rust spot I've mentioned a few times before. I'm still trying to decide if I should cut it out or treat it and weld a reinforcement over it (more for piece of mind than anything else, it's plenty strong). 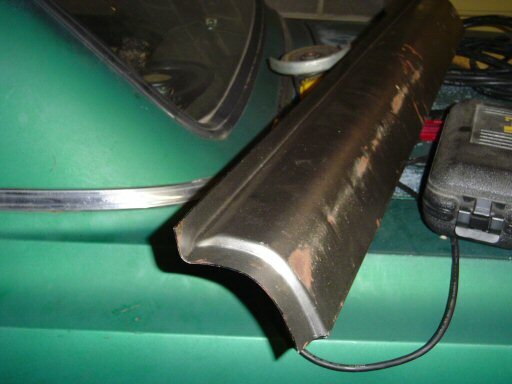 You can also see a few notches in the bottom edge of the inner rocker panel. 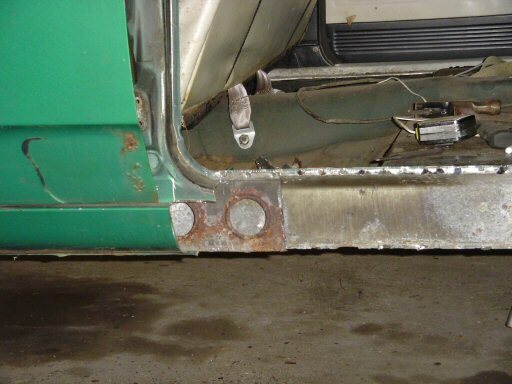 Those are drain holes for the rocker panel. The original covers also had stamped areas in it the made the drain much bigger. The new cover does not. Grafting these areas from the old cover on to the new isn't an option since one of them was really rusty and the other came off in several sections. I'll likely end up building some sort of channel into the new cover to do the same job. 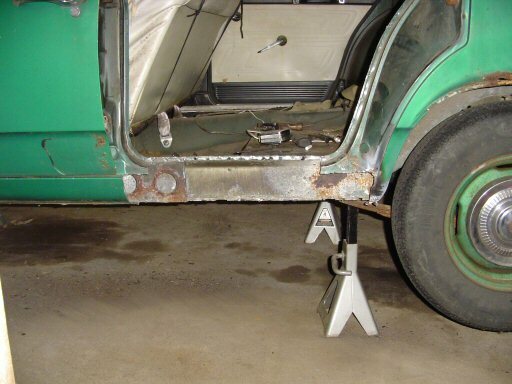 Here's a tip for you: now that you see where the rear drains are (there are two more under the front door), you should make sure that these are open on your car. If they're not, you will have rust problems due to water sitting in them. All of mine were open except for the rearmost one which was plugged up with mouse nest. 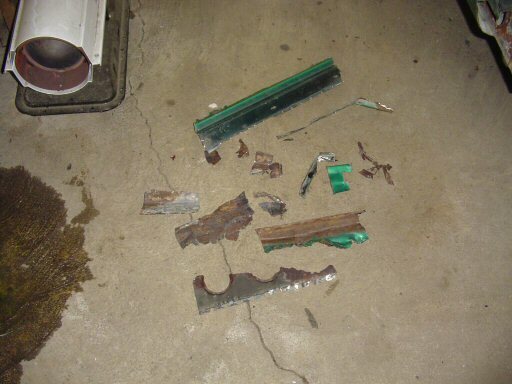 Here are the largest remains of the rocker panel. I'll be putting about three times this amount of metal back into it when I'm done. I'm replacing 24 inches of rocker cover and 21 inches of outer rocker. It still amazes my how stiff this part of the car was until I removed the last of the rocker cover.